Earlier today at Samsung's Developer Conference in San Francisco, the company has announced that the Samsung Gear 360 release date is set for April 29th. The Samsung Galaxy S7 and S7 edge may have received a lot of press, but the two new flagship smartphones weren't the only new products that Samsung unveiled at this year's edition of the Mobile World Congress. Alongside the new phones, Samsung also unveiled a 360-degree camera aptly called the Gear 360. Up until today, however, we had no word on availability, but Samsung has just announced that the Gear 360 camera will land on April 29th. Unfortunately, while Samsung has not announced the Gear 360 price, retailers listings indicate that the camera won't come cheap. B&H has the Gear 360 listed at a price of $349.99 while Adorama lists the Samsung Gear 360 price at $399.99. 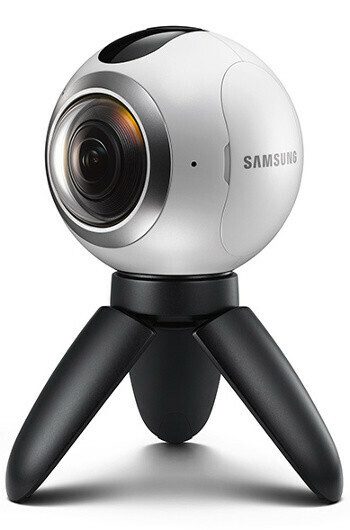 The Samsung Gear 360 makes use of two 15MP sensors, each paired with its own F/2.0 lenses with a "fish-eye" effect. You can use the device to capture either 360-degree videos at 3,840 by 1920 pixels (think of two FullHD videos stitched together on the side) or to capture 30MP (7,776 by 3,888 pixels) photos. The Samsung Gear 360 on its own doesn't come with any internal storage space, but the integrated microSD card slot can work with cards of up to 128GB in size. We should also note that the Gear 360 is also resistant to dust and water, being designed for outdoor shooting. You won't need a Samsung Gear VR headset to make use of the 360-degree photos/video coming out of the Samsung Gear 360, but Samsung is surely hoping that you'll get one. I really don't understand the use for this device and the insanely high price? Can someone enlighten me on this product and what application(s) it can be used for that the S7 camera can't handle? Again not dissing the product Just don't know if the price is justifiable for what it's supposed to do.